Motorists travelling on the M61 are delayed due to a three car collision. 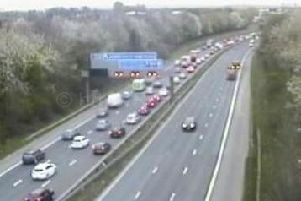 Severe queuing north of junction three on the southbound carriageway was reported at 12.40pm due to the accident on the adjoining M60 motorway surrounding Manchester. A spokesman from Highways England said: "Lanes three and four of the M60 are closed between junction 13 and junction 12 due to a three car collision." The AA said there is "very slow traffic" while the incident is dealt with, with delays of five or so minutes upon approach set to increase. At around 1.45pm Highways England confirmed that all lanes of traffic had reopened, thanking motorway police, ambulance staff and firefighters for their assistance.